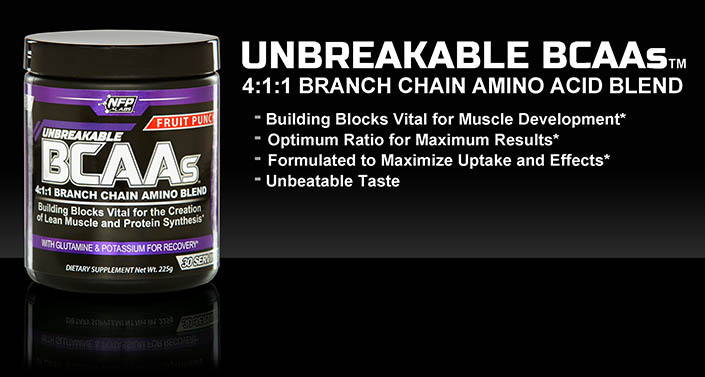 The Unbreakable BCAA formula gives you more than the basics. Hands down one of the best BCAA I have ever used. I usually use Optimum Nutrtition, but with the suggest from my coach started using NFP Unbreakable BCAAs and I can not get enough of them! The taste is amazing, not to sweet, mixes well with the IC RED Prework out. Can tell and feel a noticeable difference while training! As well as it is reasonably priced. Love this product and now recommend it to other when they ask me what I use. I use this product for me preworkout drink. I can tell the difference when I use this product. When I used to lift weights I would be weak and my recovery was painful. Since I've been using this product I am much stronger during my lifts and I don't have the extreme muscle fatigue and soreness the next day like I did before I started using this product. Great taste. Love love love this product. At 45 I knew putting on muscle mass would be a difficult task. But ever since I've been using the BCCA's from NFP the weights and reps go up consistently. The flavor of this is amazing, just like kool-aid and not gritty at all. Thank you!